Very well presented, in show house condition, three bedroom 2 storey home on the well-established residential Tropical Village. The house features 3 bedrooms and 3 bathrooms, all with air conditioning. A spacious lounge and dining area, tastefully furnished, a fitted European Kitchen with appliances. 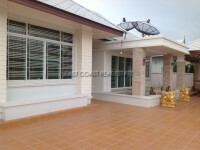 This house has been maintained excellently by the owners, who bought from construction. It has never been rented out, or had any pets; it really is in tip top condition. There is a beautiful garden and off road parking. Tropical Village is a very well managed village, and features a communal pool, children’s play area, fitness room and 24 hour security. It is located 2km from Sukhumvit Road, close to many local Thai markets, convenience stores and restaurants.